There probably isn’t a person who could disagree -no matter what it is they choose to politically believe- that The United States of America most certainly tapped into extreme emotions that have been undoubtedly expressed as it’s 2016-17 2 Personal Year Cycle completely promised would occur. While the past year favored the practice of nurturing sensitivities for America, it is now time for the nation to prepare for becoming a student in the life. Working with genuine examination of honesty and truth as it celebrates 2017’s birthday, now marks the entry into the third year of the foundation laying process within the country’s current 9 year span of time. Now that the USA’s 2 Personal Year has concluded -which watered the seeds planted in the nation back in 2015-16 in it’s 1 Personal Year– America’s current energetic cycle via numerology shifts to the 3 Personal Year. As the Moon guided their 2016-2017 2 Personal Year cycle, emotions and feelings needing to be processed where stirred up. While the Moon will still be absolutely important to observe in astrology’s current transits for the nation, the planetary attention for the year ahead now shifts to intimately looking at Jupiter via numerology. Jupiter -whether it guides a 3 Personal Year, 3 vibration karmic path (3, 12, 21 or 30th of any given month) or the astrological sun sign of Sagittarius- tells us we are meant to be focused upon philosophies, abundance, growth, willingness to be educated, foreign affairs, love of culture, foreign travel and exploration desiring to reveal the genuine truth. Equally in any natal birth chart, the placement of one’s Jupiter determines their ability to attain wisdom, where their natural “strokes of luck” can occur in the life, as well where they will hold strong beliefs to honor their truth. In a 3 Personal Year, there is a request to adhere to a learning process that allows for growth to be experienced within it. What comes next for America is all about becoming ultimately honest and expansive in order to embrace the willingness to learn and change what has been established through previous belief systems. The higher vibration of the country’s “new year” is that of the 21. (7 + 4 + 2 + 0 + 1 + 7= 21/3) The Chaldean numerological system views the 21 as ‘The Crown of the Magi.’ As much as these ancient meanings via Chaldean Karmic Mysteries were composed so long ago, their interpretations within our modern day are of absolute value for us to embrace into our understanding. Certainly, the country has all the potential to be seen by the world in a more positive light this year. The 3 energy favors looking to the glass as half full verses being half empty, so it can take current situations and begin to comprehend there are solutions that await through being adaptable to a learning process it is meant to surrender to so it’s rewards can be received. As many feel the soul of America has been and is still being ultimately tested, the year ahead assists the country to recognize this process was and is an important part of how the nation must now learn from these experiences in order to evolve. Equally, with Jupiter’s guidance over this 3 Personal Year cycle, it is a very masculine and fiery energy that unfolds. This planetary influence is ever expansive, seeking to work with mutability and the ability to communicate through truth. Once again, the country must align in the willingness to be educated in ways that have not been embraced before. When connecting the forecasting dots from numerology to astrology, we now look at the country’s natal birth chart. Being once again, Jupiter is in charge of the 3 Personal Year, this is the planet we closely observe as it equally journeys through the nation’s current transits all year long. Jupiter is a celestial vessel that moves through all 12 of the zodiac signs- spending approximately 1 year within each of them, taking 12 years to complete one turn around the entire wheel. Within 2017-18’s 3 Personal Year, this energy will be ultimately focused upon changing the country’s beliefs and philosophies, due to Jupiter now being in charge. 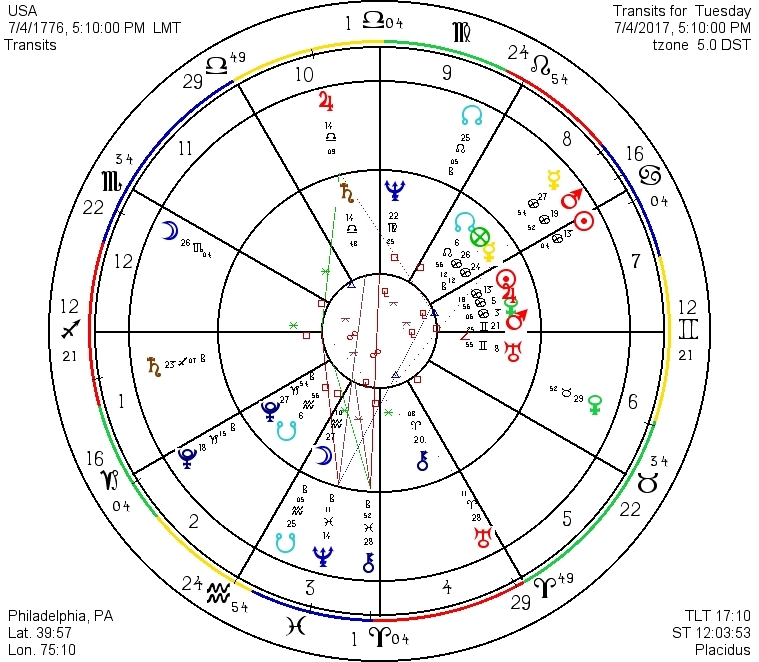 As the 3 Personal Year officially begins for the USA upon 04th July, Jupiter is in current transit in the nations’ natal 10th house of structure and career as well as how it is seen in the public eye. Equally it is conjunct to the nation’s natal Saturn at 14 degrees Libra, promoting enthusiasm within the country to be tempered- revealing profound and severe realizations for the nation to absorb asking to unblock narrow, restricted and indifferent perceptions. This indicates a specific timing is everything point as to where the USA can expect to begin a strong requirement to engage in growth in order for steady success to prevail. By 09 October, Jupiter shifts in to the nation’s 11th house of socialization, friendships, hopes, dreams, wishes and future goals just before it leaves Libra and enters Scorpio on the 10th. On 16 February 2018, it moves forward into the country’s 12th house of the inner process, subconscious realms and karmic obligations. Once Jupiter turns Retrograde upon 06 March 2018, reflection within this 12th house sector of life will be ultimately required, as a pure purging and cleansing of the nation’s ability to heal from within will be favored until it crosses back into the 11th house upon 29 March 2018. Reflection shifts at this time to what the country needs to reconsider concerning it’s overall future, it’s genuine friends and proper place amongst its’ peers. Jupiter remains in Retrograde as it’s 3 Personal Year cycle concludes upon 04 July 2018, until 10 July. As America’s 3 Personal Year commences, placing proper attention upon what can be learned to improve it’s place in the public’s eye and the willingness to be educated here is critical to adhere to. By mid February 2018, the request to then honor what is necessary to bring growth and genuine honesty to what must change concerning the country’s future will be imminent. A 3 Personal Year is equally favored to allow us to work with what the nation needs to adapt to concerning it’s foreign affairs overall. Once again, the willingness to learn and be open to shifting to different philosophies for growth allows the country to experience the positive aspects of what should be corrected for it’s future evolution. Especially between 16 February and 29 March 2018, the opportunity for intense healing will be up close and personal as Jupiter promotes a pure karmic cleansing as the nation will find it absolutely needs to take time in a silent listen to be able to learn what it is meant to process internally. Overall, the educational road ahead is a more than a truthful one to unfold throughout 04 July 2018. The time for The UNITED States of America to come together and listen to wise and just ways to work better within it’s place amongst the world –one of the strongest requests of the 3’s guidance- and not remain UNTIED is here. May growth, learning, genuine honesty, trust and finding the positive side of life guide America in this ‘The Crown of the Magi’ New Year.